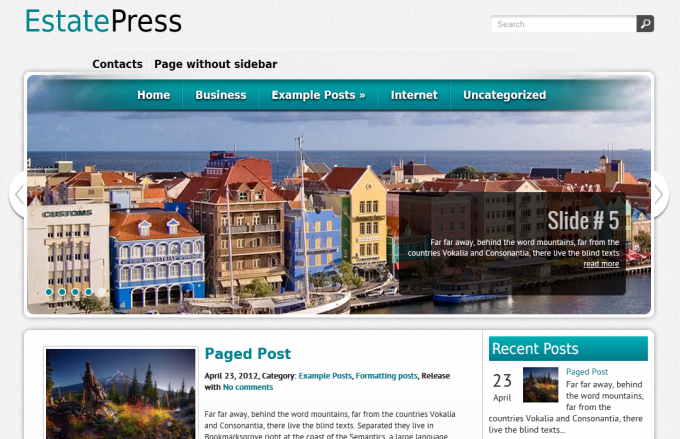 You like this blog theme? Continue to Step 2. ‘EstatePress’ is an outstanding theme of WordPress with a professional look, powerful features and tons of extras that give you the ideal foundation for a business website. It has a simple layout with nicely arranged sections, blog posts, Categories and Archives. You can use the provided Contact Page to stay connected with your potential clients. The Social share bar integrated in the theme gives you many opportunities to present your site on the social networks and stay in touch with your audiences. ‘EstatePress’ is highly customizable with options to choose and arrange widgets, menus, colors, sidebars etc according to your preferences. The impressive slideshow on the front page serves as a great Welcome message to your visitors. In the slideshow you can use the abundance of tools to arrange a great combination of text, images and music to give an idea of your site. ‘EstatePress’ is a beautiful theme that displays nicely even on the smallest screens, because it is built with a responsive web design.